A bow shock is a paraboloid-shaped shockwave that forms around a planet similar to one that forms around an airplane traveling faster than the speed of sound. We may observe this shock by the change in plasma parameters before and after entering the bow shock. Those plasma parameters include temperature, density, pressure, velocity, magnetic field and others. Another major indicator of the bow shock is the Mach number. 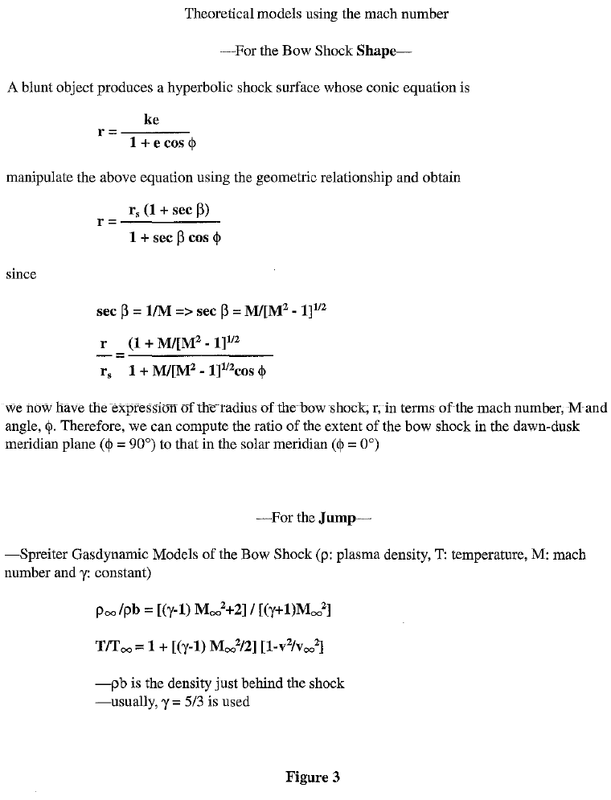 The ratio of solar wind velocity and the velocity of the sound corresponds with the shape of the shock and the size of the jump of the change in those plasma parameters. In these studies for the planet Venus, the Mach number of the magnitude about 2-5 is used, which is a much smaller number compared to that of the earth. In the interplanetary medium, the speed of sound is typically around 30 km/s and the solar wind speed near the earth is about 500 km!s. Thus, the Mach number of the earth usually around 16. This difference is due to the mass loading of the flow of plasmas at the field of the planet Venus. The earth has a much larger magnetic field around itself compared to that of the Venus, which is close to zero or almost non-detectable. Therefore, the interaction of the solar wind and the planet interaction occurs further away for the earth. 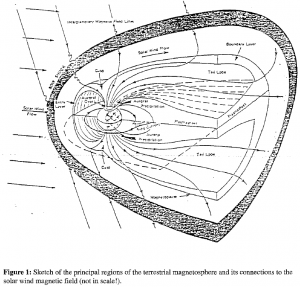 However, for the planet Venus, the interaction occurs at the closer points, therefore with more plasmas involved in the interaction, especially the neutral particles from the atmosphere of the Venus changing into oxygen ions with the help of the UV from the sun. This causes the mass loading which leads to the greater decrease in the solar wind velocity. Thus, the Mach number is smaller. 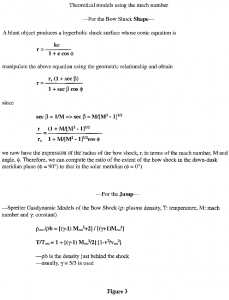 Some theoretical studies have been done to describe the shape of the bow shock and the nature of the jump at the shock point using mach numbers. In May 1978, NASA launched the Pioneer Venus Orbiter. PVO orbited Venus every twenty-four hours until Fall of 1992, taking measurements with a number of instruments designed to study the planet and its environment. 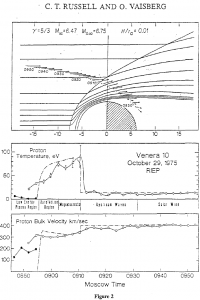 One of the instrument was the plasma analyzer (OPA), which was designed to take measurements of the solar wind. Because the instrument was designed primarily to sample the upstream solar wind, the measurements closer to the planet were not taken often enough to adequately study the bow shock. 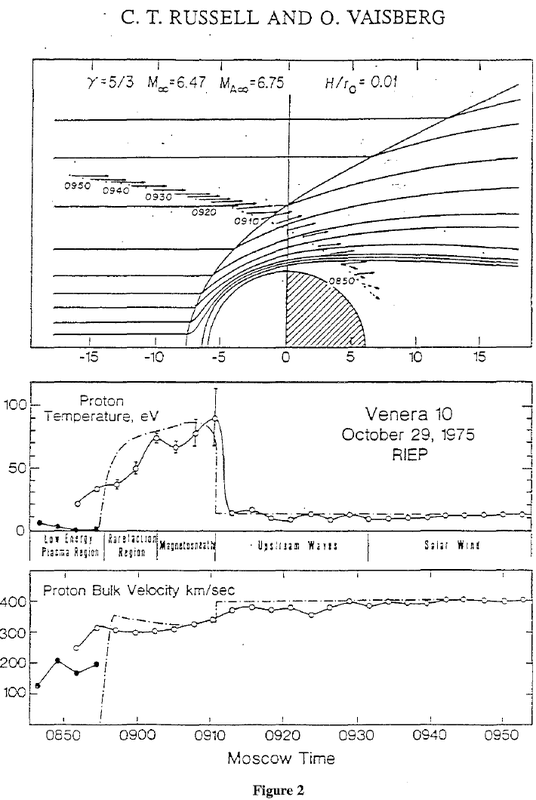 In addition, the OPA solar wind ion temperature and electron density measurements, which would be necessary for a complete study of the bow shock, are not reliable. Another instrument, the retarding potential analyzer (ORPA), was designed to take measurements of the ionosphere, including the densities and temperatures of ions, thermal electrons and suprathermal, or high energy, electrons. Because this instrument was designed to measure near the planet, the measurements were taken much more frequently than those taken by the OPA instrument. The time resolution of the ORPA data is high and the electron data is reliable. Another BYU undergraduate physics student completed the study last year which indicates that the tracking of the two data, from ORPA and OPA, is quite good most of the time if certain simple spacecraft voltage constraints are satisfied. As a result, because of the higher sampling rate of the ORPA compared to that of the plasma analyzer, the former will allow a reasonably precise study of the location and nature of the bow shock that forms upstream of the Venus obstacle in terms of the solar wind electrons. The figure on Venus Bow Shock Location presents the preliminary studies of the location of bow shock penetrations derived from orbits 1 ~ 140 and 220-360 using ORPA suprathermal electrons data. Orbits 1-65 and 220~290 are displayed in the left hand portion of the plot while orbits 66~ 140 and 291~360 are displayed in the right. We skipped orbits 141-219, since they were on the tail side of the solar wind-Venus interaction. We separated these orbits according to the traveling path of the PVO. We see asymmetry about the solar noon-midnight plane. This study is still at the preliminary stage, thus on the plots shown, the above orbit grouping does not accurately separate the bow shock crossings relative to the solar noon-midnight plane due to the 3D nature of picture. Thus, the next step to be taken is to develop an algorithm to separate the orbits accurately considering its 3D complexity. The plots showthaLthejump-theDRPAinstruments_meas_ured asitGrossed_theb9w~ho_ck. _ _ Density, temperature and pressure jump could be observed from them. This inbound orbit 78 is one of the many different kinds of jumps out of roughly 400 orbits that we have studied. As we encountered various sizes and natures of shocks, we tried to search for the possible explanation for such differences. Depending on whether the B-field is perpendicular or parallel to the solar wind, the kind of shock even at the same location varies. B-field is able to drape around the planet Venus when it is oriented perpendicular to the solar wind. It cannot drape when it is parallel to it. This is an intuitive argument. When two objects collide with one another, the hardest hit spot would be the center of the target object, in our case the solar noon-midnight plane of the Venus and the weakest hit spot would be at the dawn-dusk poles. At the hardest hit locations, the shock would be stronger and vice versa. Our next step would be to separate the data from all 5055 orbits data we have according to solar wind ram pressure and solar EUV, thus we can study the shape of the bow shock more accurately. => calculate the mach number using the velocity data to see if the theoretical model of the bow shock matches with our data.